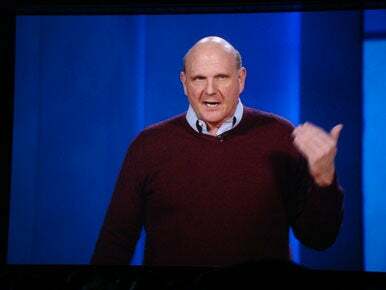 In his speech at the start of the Consumer Electronics Show in Las Vegas Wednesday, Microsoft CEO Steve Ballmer talked repeatedly about the convergence of computing around three screens—the PC, the smart phone and the television. It is now Windows, not the desktop, that Microsoft hopes to see at the center of it all, linking the three devices. It was an ironic message given that Ballmer’s biggest announcement of the night was that the public can now download a beta of the next version of Microsoft’s PC operating system, Windows 7, starting on Friday. But the PC still plays “a critical role” in Microsoft’s vision, he said. Windows 7 will make it faster to perform everyday tasks, boot up more quickly, have longer battery life, and display fewer alerts, Ballmer said, addressing some of the issues that have made Vista unpopular with users. Windows 7 is “on track to be the best Windows ever,” he said. In the end, though, it wasn’t Windows 7 but a 12-year-old girl called Sparrow who stole the show. She was on stage to demonstrate an upcoming Xbox service called Kodu that allows non-programmers to create their own Xbox games. Her fingers flitted across the controls so fast that not even Robbie Bach, head of Microsoft’s entertainment and devices division, seemed to have any idea what she was doing. But after a dazzling display of how adept children have become with computers, she had produced an altered landscape in her game that won her a warm round of applause. “Now that’s a generation-defining experience,” Ballmer said afterwards. He started his speech by acknowledging the tough economy the industry faces. But with his usual optimism he said it’s an obstacle that can be overcome if companies are able to invest through the downturn. “At the end of the day it’s the power of ideas and innovation that drive us forward, regardless of the economic environment,” he said. One area in for big change is the TV, according to Ballmer. “Over the next several years we’ll see TVs become more sophisticated and connected, and we’ll see the boundaries between the PC and the TV dissolve,” he said. Already people can order Netflix movies and stream them to the TV using an Xbox. Soon they’ll be able to order films and manage their Netflix queue with a Windows Mobile phone as well, using a new Netflix application coming to Microsoft’s phone platform later this month, Ballmer said. The PC will also evolve, to let people control it through voice, gestures and facial recognition, he said. “In the next couple of years, the PC will be able to see you and hear you,” Ballmer said. Windows 7 had been shown previously at Microsoft’s Professional Developer Conference in October. At CES, a Microsoft engineer showed how the new task bar can help to manage applications and files more easily, and said the OS will make it much easier to network home PCs and stream music and video between them. She also showed new features coming to Hotmail and Messenger. Hotmail will get a “Quick Add” pane down the right of the screen that allows people to add contextual information to an e-mail. If a person wants to send the location of a restaurant to a friend, for example, they search for it in Quick Add, click on the result, and the address is embedded in the e-mail. Other news included two new Halo games coming to Xbox this year: “Halo Wars,” the first Halo game rated “T” for teenagers, is due Feb. 28. “Halo 3 ODST,” a more traditional “Halo” game that has new characters and scenes, is due in the Fall.